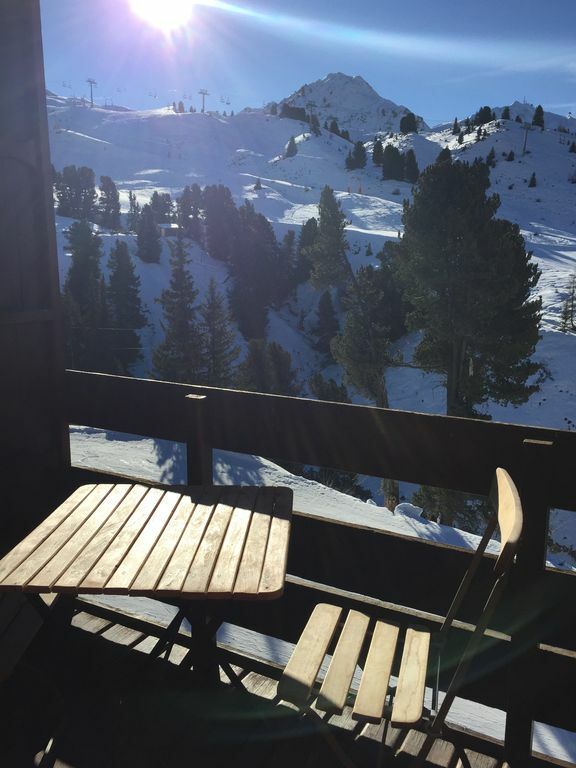 This studio apartment is in Residence Onyx in the lower part of Belle Plagne. Peter and Ann Fitzpatrick are keen skiers coming to La Plagne for the first time in 1991. They have skied La Plagne every season since 2002. They live in Tunbridge Wells Kent, both work. They adore the Savoie and Haute Savoie regions and feel completely at home in the wonderful Belle Plagne resort. The lower part of Belle Plagne is a superb location for all types of skiers and boarders. The apartments in these blocks rarely come up for sale, especially the south facing ones. This is a cosy studio apartment and yet welcoming. Linen is provided for the number of people staying. Please remember to bring towels including tea towels. There is public parking in the underground car park which has a height restriction of 1.9m. The cost is around 13euros per day. There is other open air parking in Belle Plagne which is cheaper. Equipped to be able to cater for 3 people, including, plates, cups, glasses etc, pans and utensils. Small Kitchen with a full sized hob. Sheets are included but towels are not. Please note that there is a tourist tax payable locally of 0.83 cents per day over 18. This is normally deducted by HomeAway. Two of us had a lovely 3 night stay, with 2 and a half days of fabulous skiing. The apartment was perfect for us. Well equipped, with bath and plenty of hot water - perfect after a days skiing. The location was superb, right on the slopes, truly ski in ski out, but close to the village shopping area. The parking was under ground, below the apartment which made loading and unloading easy, and kept the car clear of snow and ready to drive back to the airport with no delays on our last day. Belle Plagne is a perfect skiing location. Just a 2 min ski to all the lifts at Plagne Bellacote, and a regular gondola link running day and night to connect the villages for pedestrians. The Belle Plagne village centre has a great mix of shops, restaurants, spar, Boulangerie, tourist office, ski lift ticket office, sports shops restaurants etc. Would definitely go again and recommend to all my friends! The apartment offered everything we needed from the fantastic location, ammenities and view. We stayed for a whole week and the space was perfect for just the two of us. It was clean and easy to find thanks to instructions. Every morning thanks to the ski locker we were right on the slopes ready to go. Thanks again for a memorable trip in a superb, cute, very reasonable priced studio apartment. We hope to get out to again on the future. Great communication from owners. Lovely position in Belle Plagne, ski in/out. Well equipped. Sunny balcony. Excellent Apartment. The location was great - proper Ski In / Ski Out. The views from the Balcony where lovely. The beds where very comfortable. The Kitchen was very well equipped with everything you could possible ask for. The apartment has been updated with wooden floors and a modern design. The Supermarket is only 5mins walk away (You can either walk across the Piste or you can walk through the Under Ground car park). We had a hire car and parked in the underground car park which was easy to use. We will definitely be coming back again as we love the La Plagne ski area and have been to the area over 6 times in the past 6 years. This is by far the best apartment we have stayed in. Thanks again. The Ideal compact small studio, south facing, good kitchen, excellent position. We will return. Belle Plagne is a purpose built ski in ski out village. The highest of the Laplagne villages. The apartment is on the 5th floor of the block, Lift available. The lower ski school meeting area is just outside the building. The studio has a sunny south facing aspect with a good view. It is well equipped. Sleeps 3 people. Best for a couple with one child. We will return. Belle Plagne (2050m) is a truly wonderful resort, part of La Plagne and the wider Paradiski area, which includes Les Arcs and Peisey Vallandry, with some 225sq km of ski area. Belle Plagne has a total village feel to it, with various bars and restaurants, as well as a bowling alley, a Spar shop[ and various hire rental and clothing shops. It has two delicatessens and a bakery, which bakes the most amazing Baguettes. There is a swimming pool and ice skating down in Bellecotte, the next station down. You can catch a gondola down to Bellecôte and it only closes at midnight, so you can enjoy the Bellecôte nightlife.